If you are a road geek like me, you’ve probably spent hours and hours pouring over maps. I look at road maps, USGS maps, Atlases, old road maps, as well as the pc based maps from Google, Mapquest and so on. Sometimes it’s just for figuring out where you are going, or afterwards, where you got lost!! 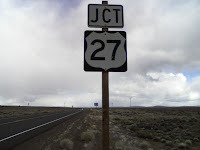 One of my favorites is researching old routes of highways. My wife has often remarked her amazement that I knew about some little road in some place we had never been. Of course, when I’m not Super Map Guy, I can be Super Boring Guy point out and obscure piece of pavement that used to be a US highway, but was bypassed and then decommissioned….blah blah blah while she is wondering if I noticed that red light ahead. But I digress greatly. I had been one to resist the handy GPS devices as just a piece of technology that I did not need. It took a combination of seeing a GPS working, my eyes having a hard time seeing signs and maps in the dark, and getting lost in Dallas that made me break down and buy one for HER. It was especially easy when their prices started dropping below $100 around Christmas and I was able to find one for $80. So being the geekier of the two of us, I put it in my car and learn how it worked and what it did and didn’t do. So here I am learning how it works and jumping around the screens and suddenly it hits me. This is pretty cool…. Not for the obvious feature if knowing where it is and how to get anywhere in the US. Ahem… It couldn’t figure out how to drive TO Puerto Rico. 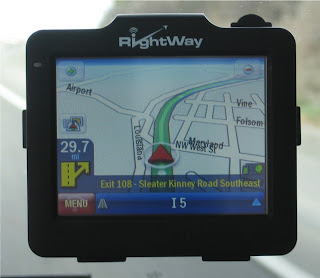 This GPS was pretty cool because it’s basically a zoomable map of every road in the US. I know you can do that at home on your computer, but this is like a moving map that goes along with you… and is almost like radar in that it can see roads beyond the trees, even when I can’t. That’s pretty cool. Depending on the views available, you can view the road from above like from a blimp, or if you prefer, a very slow private jet. I usually have the silly thing on, even when I know where I’m going. Just this afternoon coming home from church, I found what appears to be an old section of Pacific Highway that still has its narrow concrete roadway in excellent shape. So go ahead, get that GPS. You don’t have to let it tell you where to go. Watch the road, use the radar, er.. GPS as needed. Just enjoy the ride and the map that moves along with you. A final fun note. Once in a while, ignore the GPS directions. Keep it guessing. It can be your protest of technology, before the GPS takes over!! Get rid of the suction cup! US 27 stretches from Miami to the Michigan border, but this looks pretty desolate and desert like for that part of the country. Here's some links below to help you play Road Geek Detective. Hint: It wouldn't be the first or last time there was a shield error.